Tanks, bulldozers and armored personnel carriers knocked down a fence and barreled over the Israel-Lebanon border Saturday as Israeli forces stepped up a small-scale ground offensive into southern Lebanon to try to cripple the Hezbollah guerrilla group. The growing use of ground forces, 11 days into the fighting, signaled Israeli recognition that its airstrikes alone were not enough to force Hezbollah out of southern Lebanon. But a ground offensive carries greater risks to Israeli forces, which have already lost 18 soldiers in the recent fighting. And it threatens to exacerbate already trying conditions for Lebanese civilians in the area. Israeli military officials have said they want to push Hezbollah beyond the Litani River, about 20 miles north of the border, with the Lebanese army deploying in the border zone. An Israeli radio station that broadcasts to southern Lebanon warned residents of 13 villages to flee north by Saturday afternoon. The villages form a corridor about four miles wide and 11 miles deep. A force of about 2,000 troops, backed by tanks and armored vehicles raced past a U.N. outpost and headed into Maroun al-Ras. 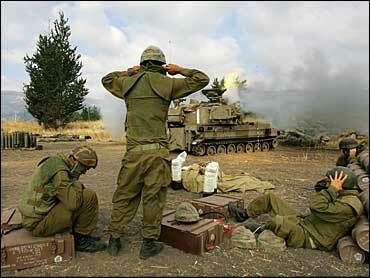 Gunfire could be heard coming from the village, and artillery batteries in Israel also fired into the area. "The forces have completed, more or less, their control of the area of the village, Maroun al-Ras, and made lots of hits against terrorists," said Maj. Gen. Benny Gantz, chief of Israel's ground forces. "It was a difficult fight that continued for not a short time." Dozens of Hezbollah fighters were injured or killed in the battle, Gantz said. Hezbollah said two of its fighters were killed Saturday, bringing the total number of acknowledged Hezbollah fighters killed to eight. Israel accuses the group of vastly underreporting its casualties. The village was strategically important because it overlooked an area where Hezbollah had command posts, Gantz said. The forces seized a cache of weapons and rockets in a mosque in the village, he added. After Israel seized Maroun al-Ras, which is believed to be a launching point for the rocket attacks on northern Israel, several small groups of Israeli soldiers in armored personal carriers traveled to and from the village. U.N. peacekeepers and witnesses said the Israeli forces briefly held the nearby village of Marwaheen before pulling back. The Israeli army said it wanted to completely destroy all Hezbollah infrastructure in an area between a half-mile to two miles from the border, but it had no intention of going deeper into Lebanon than that. "We really want to knock out Hezbollah in this area," said Capt. Jacob Dallal, an army spokesman. "We want to wipe them out, and we don't intend for them to ever be there again." A senior Israeli military official confirmed that Israel did not plan to reoccupy southern Lebanon — as it did from 1982 to 2000 to create a buffer zone to protect northern Israel.